I'm actually not a complete car and racing fanatic, but nevertheless I'm very interested into both. I've been several times at the DTM (Deutsche Tourenwagen Masters as well as its predecessor Deutsche Tourenwagen Meisterschaft) events. I have had a certain affinity to Opel while they were active, but actually I'm more interested in a good race than in supporting a specific vendor. This is my previous car. 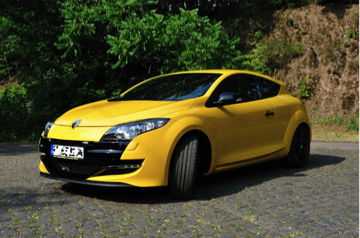 A Renault Megane 3 Renault Sport. It is a fantastic hot hatch, which has a superb performance on track days and also country roads. Meanwhile I switched to a Megane 3 Grand tour GT Line (2.0 dci). Why? Simply due to practicability. And for Sports I have my Renault Alpine A310 V6 S.